This gets a lot of use in my kitchen. In one motion, it cuts perfect apple slices. Works great for slicing caramel apples, too! Seems like every time I plan to cook with apples, I can't remember which ones are best for pie or muffins or applesauce. I'd like to try some of the newer varieties, but which ones? I end up googling or hunting for information in the apple aisle at the grocery store. There are so many varieties of apples, it can get overwhelming trying to choose. That's why I decided it would be helpful to compile some tips for choosing apples and put them in a fact sheet to print out and always have available. No more hunting around for info every time I need to buy apples. Below you will find my apple fact sheet that you can download and print. It would be handy to keep it in a folder or notebook with your cookbooks. That's where I put mine. One disclaimer, though. I didn't find 100% agreement on the best use for every apple listed on the fact sheet. That's why I compiled the information from several reputable sources (US Apple Association, Cook's Illustrated, Pick Your Own) and summarized recommendations where I found the most agreement. Your individual tastes and preferences should ultimately guide which apples you use. Here's the apple fact sheet in downloadable form followed by the complete content of the fact sheet for you to view in the remainder of this post. This is a summary of recommended uses for some of the more popular apple varieties. Some apples are better suited for eating raw because of their texture and flavor, others are better for pies and baking because they hold their shape when cooked, and others have the texture and flavor for better applesauce. Raw for snacking and salads—Personal taste and preferences vary widely—it’s up to you whether you prefer sweet or tart. Fuji and Honey Crisp are currently the most popular varieties. Pies and baking—Choose only apples that hold their shape well during cooking. 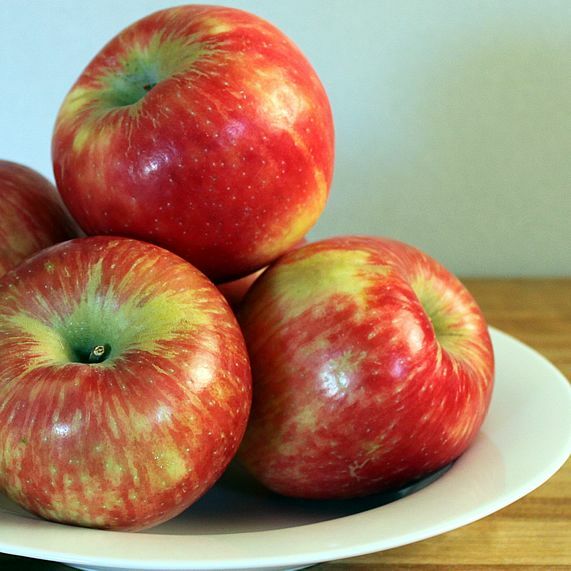 Golden Delicious, Baldwin, Cortland, and Idareds are highly recommended by Cook’s Illustrated. Sauce—Choose sweeter apples if you prefer unsweetened or low-sugar applesauce. Gala, Rome Beauty, Stayman, and Golden Delicious are highly recommended. Juice—Choose a combination of apples to achieve the sweet/tart flavor you prefer. Most apples are good juicers; Honey Crisp is considered a good choice for a balance of sweet and tart. Freezing—(not on chart) Golden Delicious, Rome Beauty, Stayman, Jonathan, Granny Smith. Try a mixture of apple types in a single recipe. Experiment and find the ones that best suit your taste. My personal favorite eating apple used to be Fuji. But recently Honey Crisp has become my favorite. What is your favorite apple for eating or cooking?